Destroyed by battle (Japanese: 戦（せん）闘（とう）で破（は）壊（かい） Sentō de hakai) specifically refers to a monster being destroyed during damage calculation due to the battle. Whether or not monsters are destroyed by battle is determined during damage calculation. Many effect requirements can be fulfilled when a monster is destroyed this way, an example being "Skyscraper 2 - Hero City". In the Damage Step, during damage calculation, if two Attack Position monsters battle each other, the one with the lower ATK is destroyed by battle, or both if they have equal amounts of ATK. If a Defense Position monster is attacked, neither battling monster will be destroyed by battle unless the attacked Defense Position monster has less DEF than the attacking monster's ATK. If a monster is destroyed by battle, it will be sent to the GY at the end of the Damage Step. 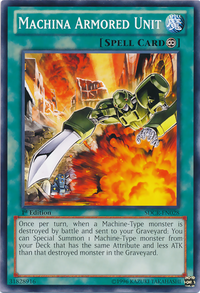 Some cards, such as "Mystic Swordsman LV2" and "Drillroid", have effects that destroy battling monsters during the Damage Step. However, cards destroyed this way are destroyed by that card effect, so are not considered to be destroyed by battle.